• Door Knob Bag. This product is available in white only. 3.0 mil. 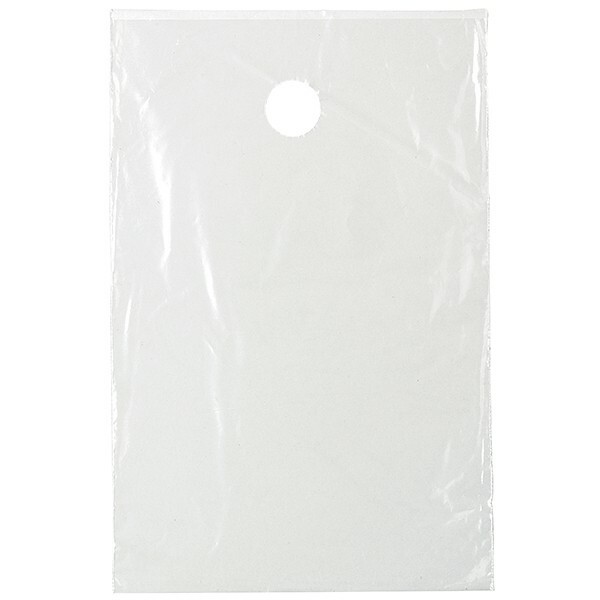 clear plastic bags with a 1½" diameter hole that fits standard door knobs. A marketing campaign you can "hang" your hopes on! 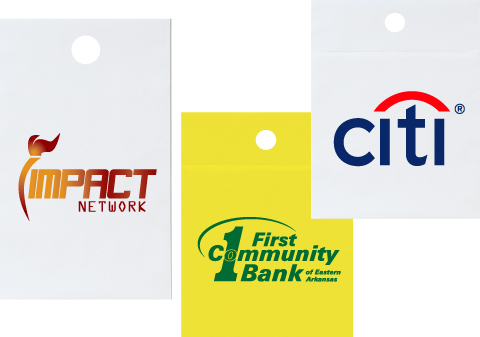 These bags are designed to hang from door knobs, making them ideal for filling with coupons, notices, and other advertising materials. Features 1.25 mil. gauge material and single-walled construction. The perfect way to distribute literature at homes, apartments, and offices. Customize this bag with a vivid illustration of your company name and logo to leave an unforgettable impression! Keep your message hanging around. UV coated door hangers can be used to promote any product, service or company in a creative and fun way. Perfect for schools, libraries, offices, hotels, motels, any place with a door, a peg, a place to hang something. Keep your message hanging around and attach your business card! 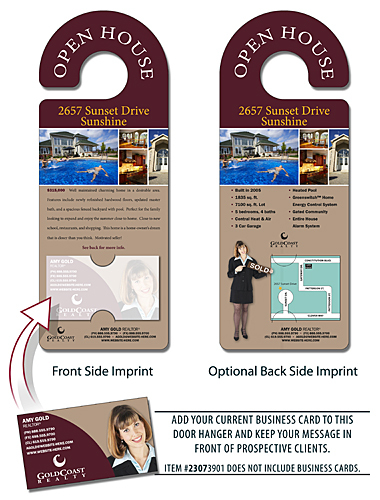 Full-color door hangers can be used to promote any product, service or company in a creative and fun way. Perfect for schools, libraries, offices, hotels, motels, any place with a door. Sturdy 14 pt. laminated product. Keep your message hanging around. 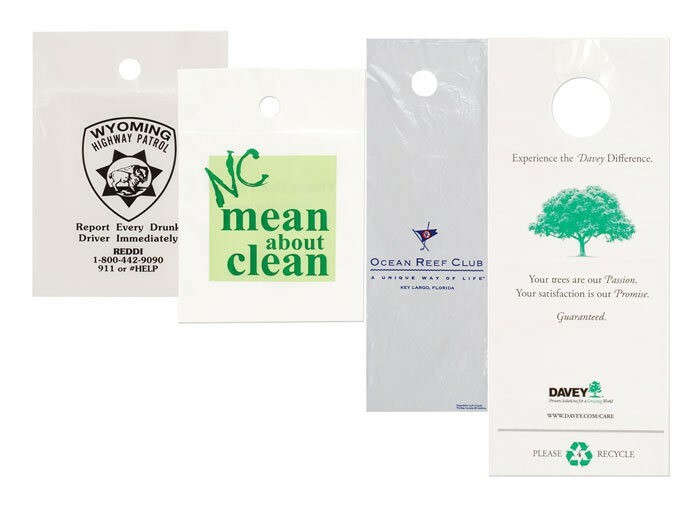 Plastic UV coated door hangers can be used to promote any product, service or company in a creative and fun way. Perfect for schools, libraries, offices, hotels, motels, any place with a door, a peg, a place to hang something. Plastic Door Hanger - 3x8 Laminated - 14 pt. Keep your message hanging around and give them a something to take with them - a detachable portion at the bottom! 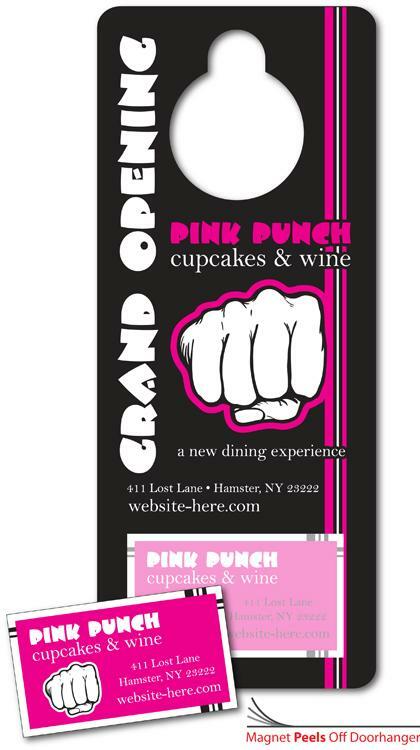 Door hangers can be used to promote any product, service or company in a creative and fun way. Perfect for schools, libraries, offices, hotels, motels, any place with a door. Sturdy 14 pt. laminated plastic. Door Hanger - 4x10.5 Extra-Thick Laminated - Round Handle - 24 pt. 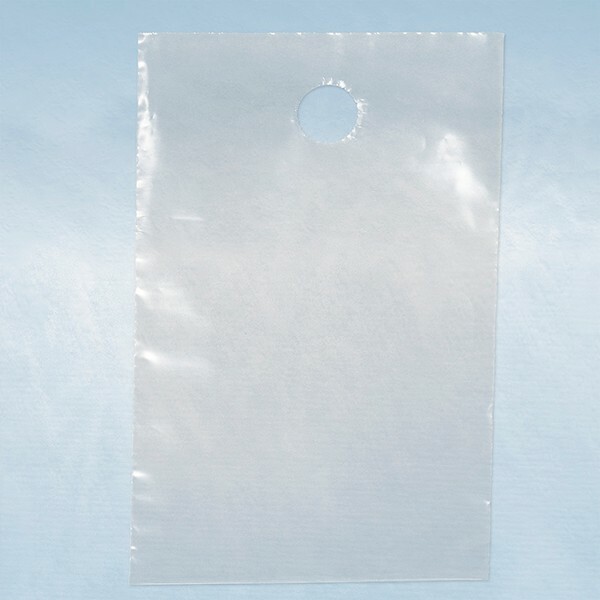 Clear door hanger bags. 6.125 x 12.375 (16.5" including Hanger) Strong 1.2 mil material Water Resistant 100% Quality Guaranteed A great way to meet your clients at the door... Economical, easy to use Clear Door Knob Hangers greets your customer at the door when you can't be there! 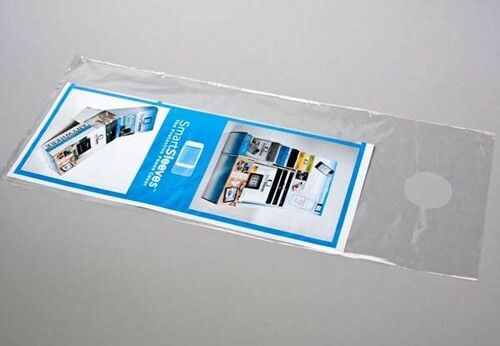 Great for flyers and other promotional items, and they are protected from the weather! Just slip your information inside the bag and place the bag over the door knob... and you're on your way! Save money over postal charges. 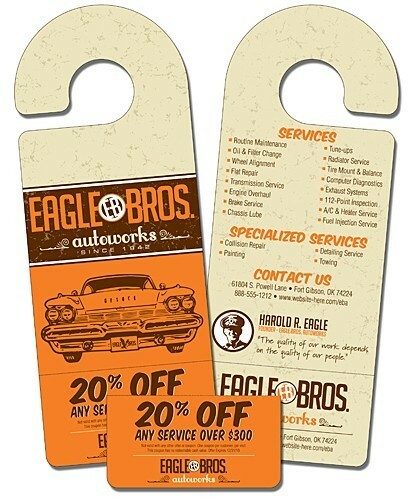 Door Hanger - 3x8 Extra-Thick UV-Coated (1S) - 14 pt. Keep your message hanging around. Extra thick UV coated rectangle shape door hangers can be used to promote any product, service or company in a creative and fun way. 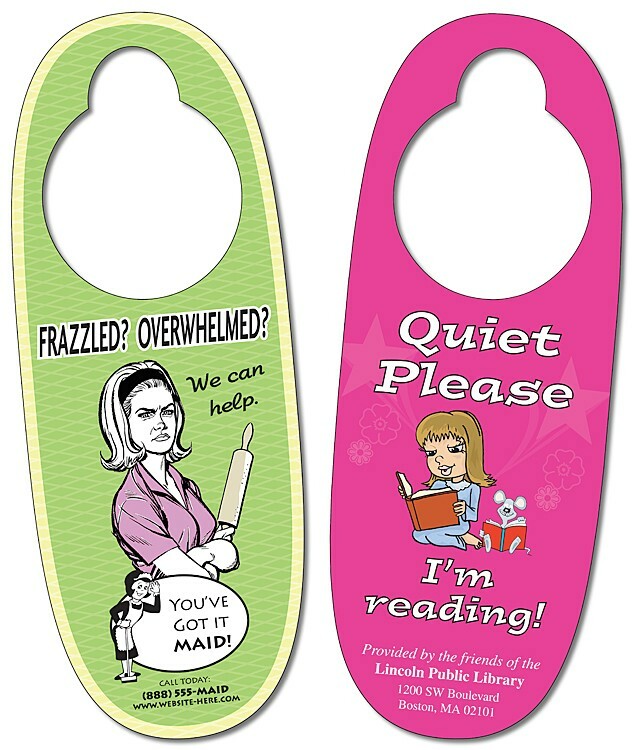 Perfect for schools, libraries, offices, hotels, motels, any place with a door, a peg, a place to hang something. CATCH EM'' AT THE DOOR! 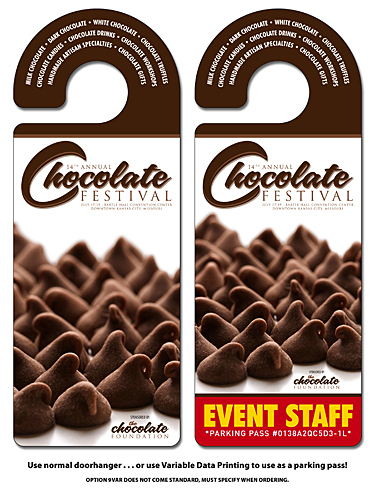 Magna-Hang laminated door hangers give you extra impact in your marketing. Your business card magnet is glued to the surface of the door hanger. UV-Coated Door Hanger - 3x8 Extra-Thick Oval Shape - 14 pt. Keep your message hanging around. UV coated extra thick door hangers can be used to promote any product, service or company in a creative and fun way. Perfect for schools, libraries, offices, hotels, motels, any place with a door, a peg, a place to hang something. Political Door Hanger - 4x10.5 Laminated - Round Handle - 14 pt. Keep your message hanging around. Round Handle Door Hangers can be used to promote your political campaign in a creative and fun way. Sturdy 14 pt. laminated product. 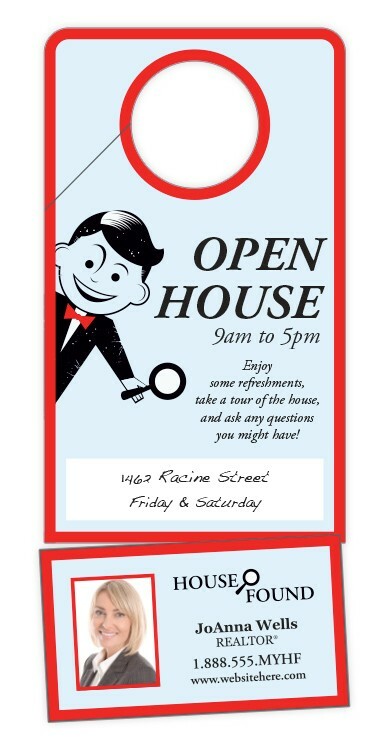 Door Hanger - 4x10.5 UV-Coated (1S) with Rounded Handle and Business Card Insert - 10 pt.